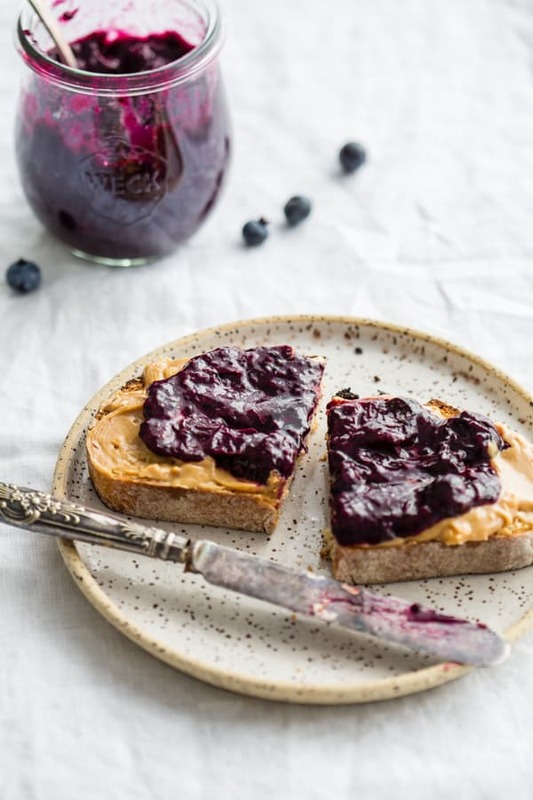 This recipe will show you how to make chia seed jam 3 ways using simple and fresh ingredients! 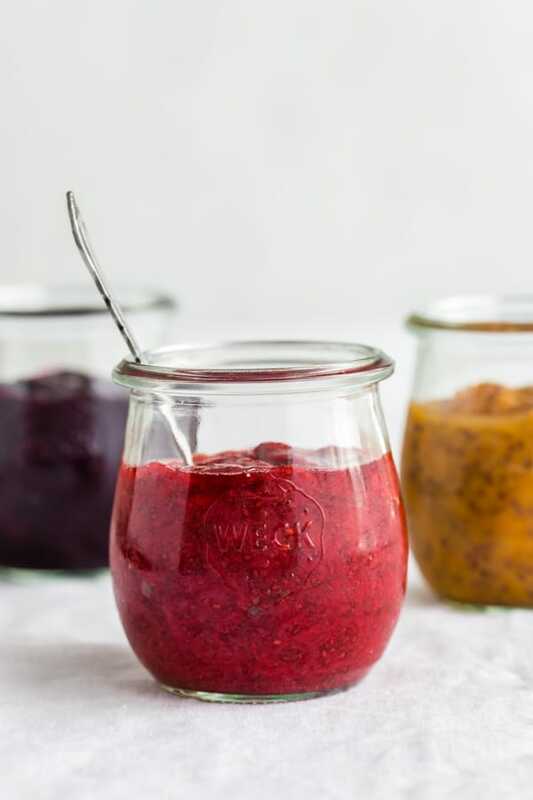 Learn how to make peach seed jam, strawberry chia seed jam and blueberry chia seed jam! My summer so far has been filled with almost daily trips to the farmer’s market. I recently moved a 5-minute walk away from a local farmer’s market, so I’ve been enjoying doing my groceries in smaller batches, and just getting all my produce as fresh as can be! One thing I love about my market trips is seeing all the different produce that becomes readily available as the weeks go on. Right now I’m beginning to see lots of peaches, blueberries, strawberries, corn and tomatoes. 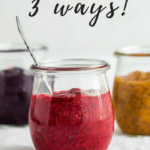 Last week I used fresh tomatoes from the market to make this homemade tomato sauce, but this week I’m using my finds to make something a little sweeter, this chia seed jam 3 ways! Technically you can create this jam with any type of fruit you like. Raspberries, mango, apricots…etc. Just replace the fruit in the recipe with your favourite fruit of the season! 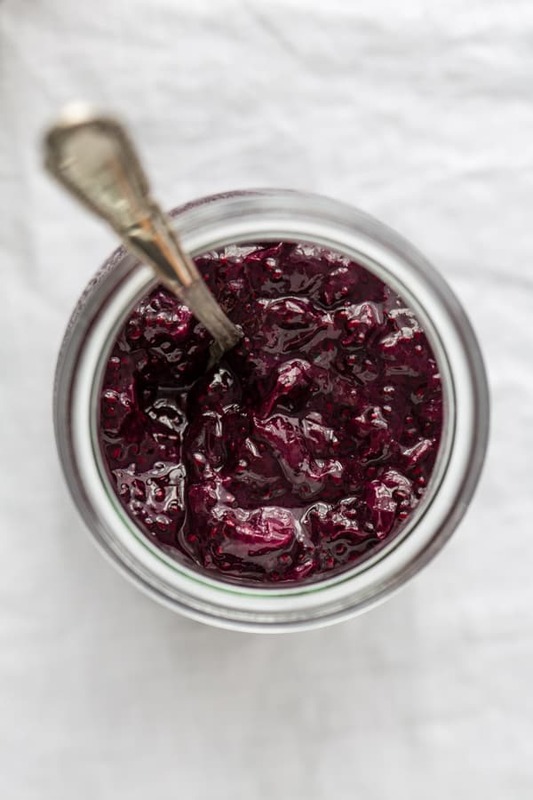 Of course, chia seeds are essential to making a good chia seed jam! I use Sunfood chia seeds in this recipe. 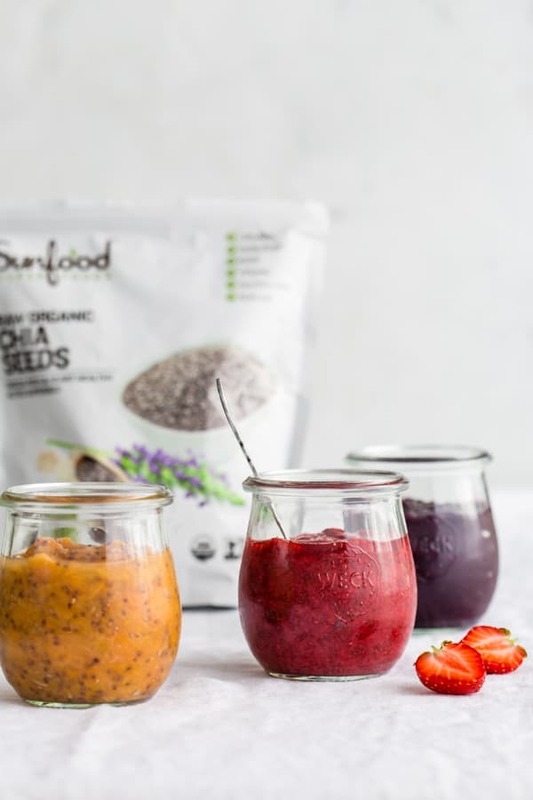 Sunfood makes all sorts of great superfood products, but one of my favourites is of course their chia seeds. 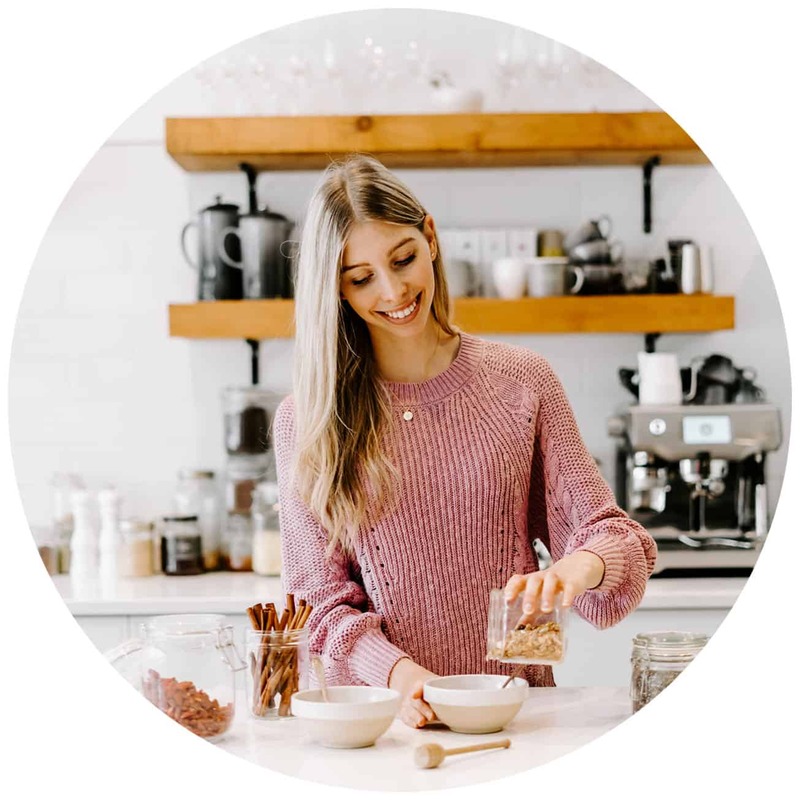 These little superfood seeds are high in Omega-3, high in fibre, and loaded with vitamins and nutrients like calcium and iron to keep you feeling healthy! 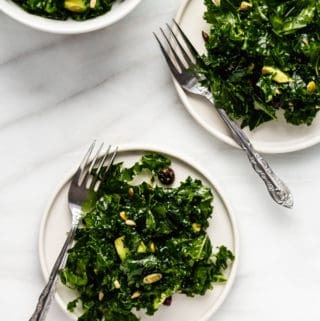 Chia seeds are definitely essential to this recipe, so don’t try to swap them out for something else! You can however, swap out the maple syrup for your sweetener of choice. Any sticky sweetener or even plain sugar will do just fine. 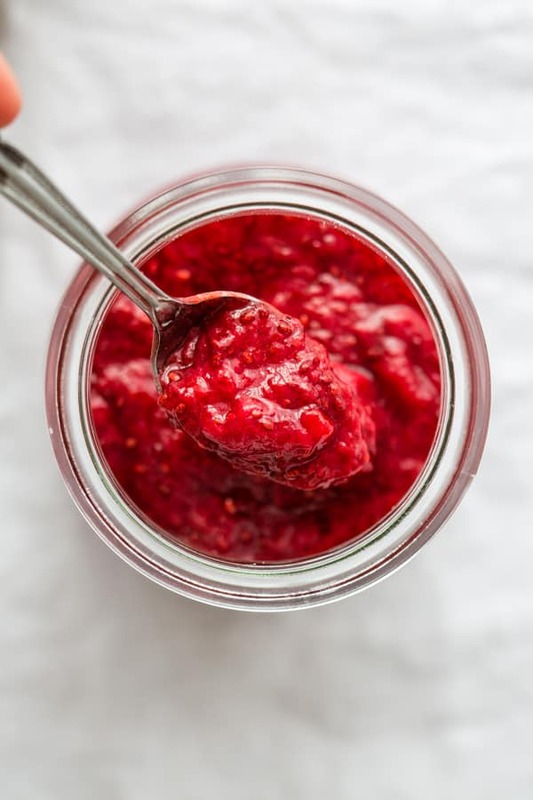 When cooking down the fruit for this chia seed jam, you’ll notice that some fruits (like strawberries) have a lot more water in them than other fruits. (like peaches) This just means you’ll have to cook the strawberries in the pot for a little bit longer so the excess water boils off. 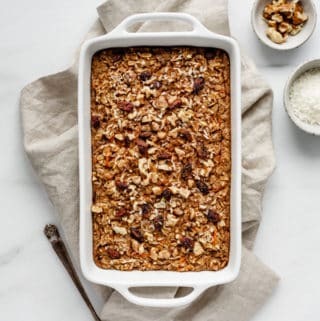 If you’re making this recipe is different fruits, make sure to keep this tip in mind as some fruits may need a bit of adjustment in cooking time! Since this jam is fresh, it won’t keep in the fridge for months as other canned jams would. It stores well for about a week. (if it’ll last that long!) This chia seed jam 3 way would be great to top these lemon poppyseed pancakes on top of this coconut chia pudding! 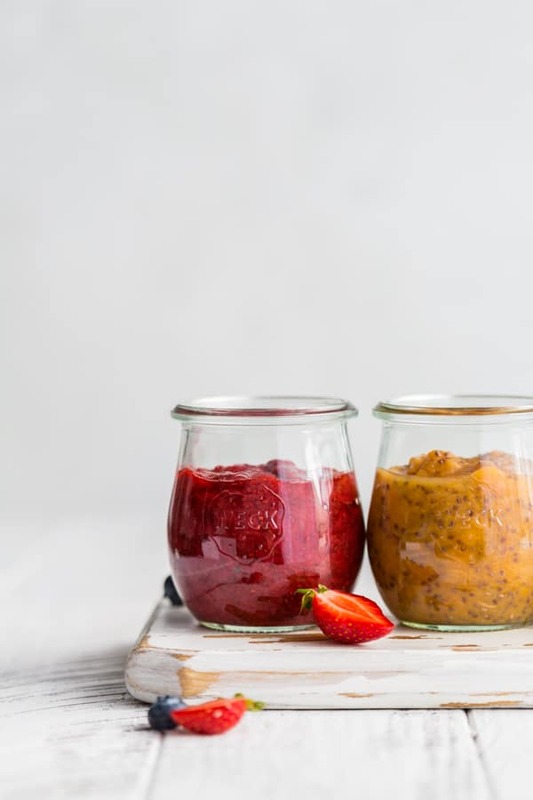 Super fresh chia jams made with fresh peaches, blueberries and strawberries to top any of your favourite recipes. YUM! Once it begins to bubble, reduce heat to medium-low letting cook for 10-15 minutes, occasionally stirring with a wooden spoon. Once the mixture is thickened, add the lemon juice and maple syrup and mix until combined. Remove from heat and add the chia seeds mixing until combined. Pour into a jar and let cool to room temperature on the counter, then cover with a lid and place in the fridge. Let sit for at least an hour before using. The peaches will need the least time to cook since they have the least liquid, and the strawberries will need more time since they have more liquid. Use three separate pans to cook each jam at the same time, or make one after another in the same pan. Looks absolutely amazing Jess! 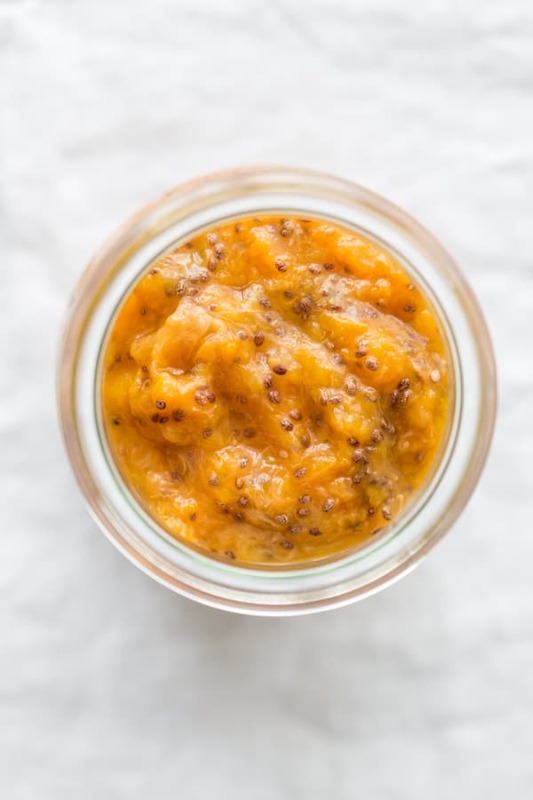 I love the sound of the peach chia jam! I just have to wait until peach season arrives in Australia, eeek! The strawberry and blueberry chia jams look fantastic! 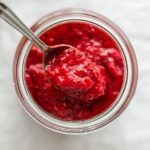 I have always loved jam and the addition of chia seeds are always a plus. Gotta have that extra crunch in every bite! 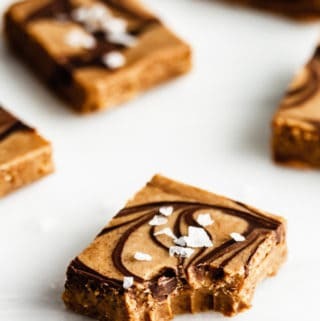 Love these this recipe is too easy. Makes it much more convenient for me to recreate! Thank you Cassie! I’m a sucker for jams and fresh bread, especially in the summertime. It’s just so good! I just made the strawberry and blueberry jam. I did not have any peach on hand. It is absolutely yummy. I like that it is a healthier alternative jam without sacrificing the taste. Thank you so much! I’m so happy to hear you enjoyed these jams. You can make them with most fruits and they are definitely a great healthier option than traditional jams! Hello, how long is the shelf life? Hi Ann! It should last about 1-2 weeks in the fridge!